Organized in 2006, Habitat for Humanity of Mariposa County is an independently operated affiliate of Habitat for Humanity International. We are a non-profit, Christian, housing ministry dedicated to making shelter a matter of conscience. Building relationships and community is as important to us as building homes. We invite people of all faiths and walks of life to work in partnership to lend a hand to those in need of decent, affordable housing. The essential building blocks of the Habitat program are volunteer labor and donated materials, which are utilized in the building of simple, decent homes. Habitat homes are sold to partner families on a no-profit basis, with 0% interest mortgages. 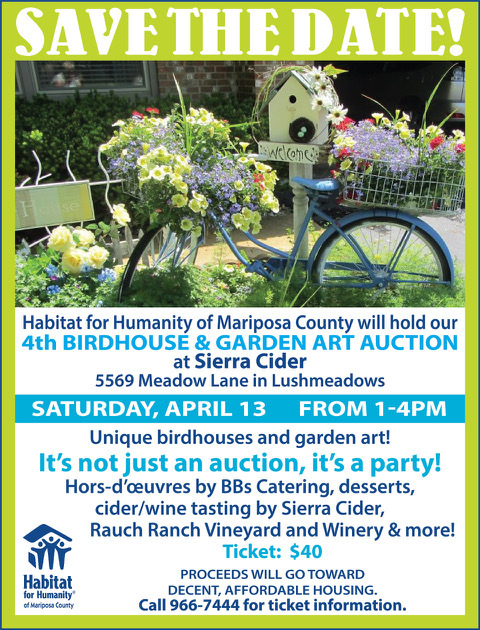 HFH of Mariposa Co. generally holds the mortgage for 20 to 30 years. Payments are recycled to finance more housing through our Revolving Fund for Humanity. We use three basic criteria in our family selection process: need for adequate shelter, ability to pay, and willingness to partner. with Habitat. With these in mind, we conduct an extensive screening process of applicant families, including housing, employment, credit and personal reference checks, followed by in-home family interviews. Families must be willing to contribute 350 hours of sweat equity building their homes as well as homes of other Habitat families. “Partnership” is the word most commonly associated with Habitat for Humanity. We join those who require assistance with others who are willing to provide a hand up – not a handout – to a better life. We truly believe there is an opportunity for all to find fulfillment within Habitat as we serve one another. Habitat for Humanity of Mariposa County has an open-door policy: All who believe that everyone needs a decent, affordable place to live are welcome to help with the work, regardless of race, religion, age, gender, political views or any of the other distinctions that too often divide people. In short, Habitat welcomes volunteers and supporters from all backgrounds and also serves people in need of decent housing regardless of race or religion. As a matter of policy, Habitat for Humanity International and its affiliated organizations do not proselytize. This means that Habitat will not offer assistance on the expressed or implied condition that people must either adhere to or convert to a particular faith, or listen and respond to messaging designed to induce conversion to a particular faith.